A total of 70.9 million prescriptions for antidepressants were dispensed in England in 2018. NHS Digital figures show that the number of drugs issued - for conditions like depression and anxiety - went up from 67.5 million in 2017. The total is almost double the number dispensed in 2008. The figure includes all items issued by the NHS in England, except those given out in hospitals or on private prescriptions. Figures published in Scotland last year showed a similar trend, with 6.6 million items dispensed in 2017-2018, compared with 3.8 million items in 2007-2008 — an increase of 73.7%. In Wales, the number of items dispensed rose by 168% between 2002 and 2017 to 5.6 million. In Northern Ireland, 3.1 million prescriptions were dispensed in 2017-18 - up from 2.4 million in 2013-14. Should we worry about taking antidepressants? An NHS England spokesman said: "While antidepressants play an important role for some patients, an attitude of 'a pill for every ill' can mean not only do some people end up taking medicine they don't need to, but taxpayer funding is spent on avoidable prescriptions." Prof Helen Stokes-Lampard, who chairs the Royal College of GPs, said that family doctors only prescribed medication after fully investigating a patient's circumstances and concluding that drugs were the best option. "It's really important that increasing numbers of antidepressant prescriptions are not automatically seen as a bad thing, as research has shown they can be very effective drugs when used appropriately," she said. 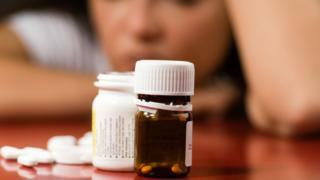 Prof Stokes-Lampard said that part of the rise in prescriptions could be down to an increased awareness of mental health conditions in society, and more people feeling able to seek medical advice. "No doctor wants their patients to be reliant on medication - and most patients don't want this, either - so, where possible, we will consider alternative treatments, such as CBT and talking therapies. "Unfortunately, access to these important services in the community is patchy across the country." Vicki Nash, from the mental health charity Mind, said it was crucial that resources and training were made available to GPs to cope with increased demand, and to help people access the best possible treatment. She said: "We currently live in turbulent times and the impact of Brexit on the nation's mental health is hard to measure. We know political and world events can create a great deal of uncertainty, which can make some of us feel anxious, stressed and down. "If feelings are overwhelming or affecting your daily life we do recommend speaking to a friend or family member or go to your GP, who can talk you through the support that's available." Overall, the total number of prescription items dispensed increased slightly, by 0.3% from 1.1 billion in 2017.